As his two youngest sons were growing up, they worked in their father’s shop, and were apprentices. They did any kind of sheet metal work, including stoves, gutters, and furnaces. During WWI, Glenn joined the Army and served overseas in Germany, while Floyd finished school and continued to help in his father’s shop. After the war, Glenn came home to help support his father’s shop. Andrew’s health began to deteriorate shortly afterward, and Glenn and Floyd gradually took on more responsibilities in the shop. 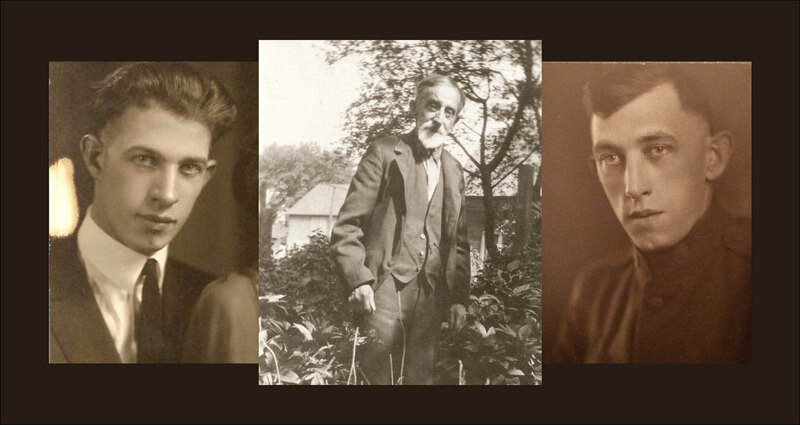 When Andrew passed away in 1923, Glenn and Floyd were in business all on their own. 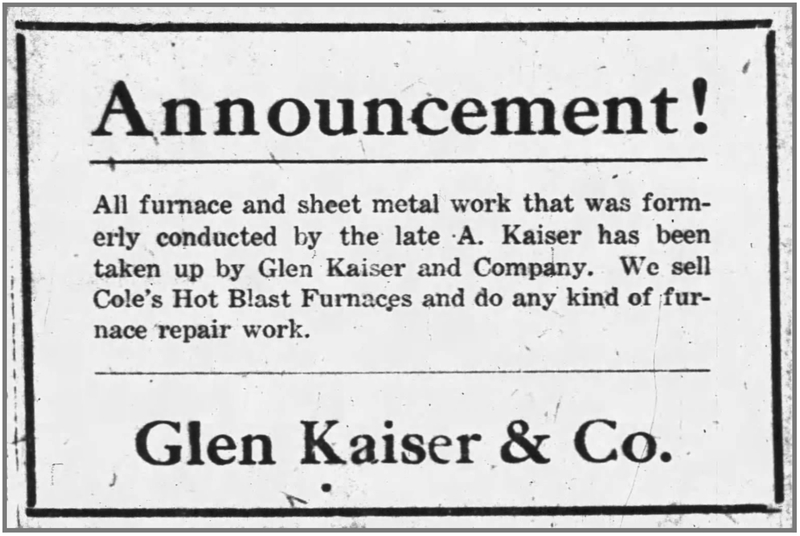 They changed the name of their enterprise to Glen Kaiser & Co., and shortly afterward, Kaiser Brothers. Kaiser Brothers would not continue when one of the brothers died. Floyd passed away suddenly in August 1935, leaving Glenn to the business on his own. Glenn quickly decided that he didn’t want to continue the business without his brother. He rented the business to another local craftsman by September 1935, just two weeks after Floyd’s death. 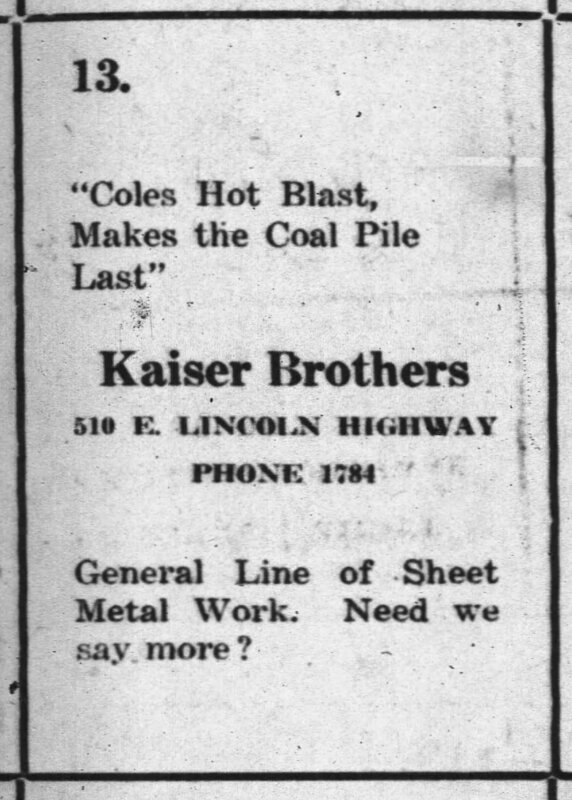 The Kaisers’ tinning trade had lasted two generations, a move from Whiteside County to DeKalb County, several locations in DeKalb, the Great War, and the Great Depression, but it could not survive the loss of a brother. 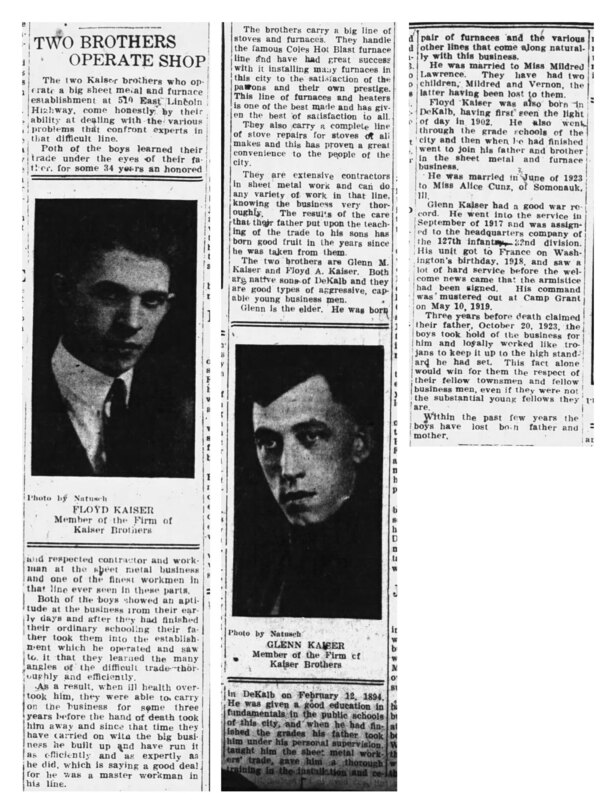 Kaiser family photos and documents, originals; Kaiser Family papers, privately held by Emily (Drake) Weil, Kingston, Ill.
“Kaiser Brothers,” The Daily Chronicle, DeKalb, Ill., 20 Jul 1925, image copy (www.newspapers.com : accessed 5 Aug 2018), page 8; Newspapers.com World Collection. How wonderful to know so much about these hard working brothers… an interesting post. Thank you. I didn’t expect the business to leave the family so soon. Floyd’s death must have hit Glenn very hard. Yes, it seems to have been going strong through the Depression, but Floyd’s death changed everything in an instant. He died at the young age of 35. Great example of how looking at occupational information can give you a wealth of information about family dynamics. Think how close those brothers had to have been! No, unfortunately the building on Lincoln Hwy and the building that they moved from 510 Lincoln Hwy to Girard St were both torn down before I was born to build the DeKalb Post Office building and parking lot. I only have one photo of the building as a tavern. It will be shared in a future post!